Since its creation on 31 January 2008, the Popmundo Bible has always focused on the multilingual aspect. If you want to report a translation mistake, please contact the translator in charge of your language. If you find some French text despite the fact you are supposed to display another language, that means this creepy Jörgy forgot to clean his mess and should be beaten to death with a trout. Contact him right away and make him pay for his sins! 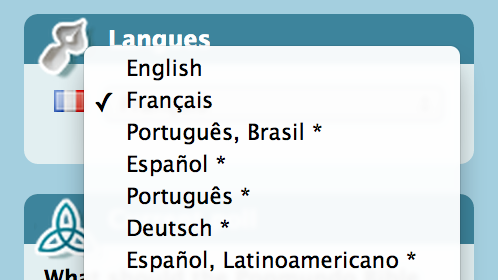 For now, the website isn't translated in every language available on Popmundo. українська, Norsk & Chinese aren't translated at all, there are some outdated languages, especially Dansk, Español Latinoamericano, Nederlands, Polski, Русский, Română, Suomi & Svenska. We'd be very glad if some native players could help us make the website available for everyone. To add a language and translate the interface, you just have to contact Jörgy. However, don't forget that you'll have to find every skill name and description, and also every book needed to learn a skill. And obviously, you need to have good knowledge of the English language. You can contact Jörgy in French or English on Popmundo via private conversation or the thread 2106812. To this day, the website has been visited around 891414 times, 4 today in particular. There are by the way 4 people hanging out on this very website right now.